It's time for some fun! It's Friday, which means I'm linking up with the girls over at the Friday Five 2.0 link up. Today's theme is sharing five things most people won't know about you. This was actually a little difficult for me because I'm pretty open here on the blog. I had to dig deep on this one. Before I continue, as mentioned, I'm linking up with the ALL-NEW Friday Five 2.0 link up, hosted by Rachel at Running on Happy and Lacey and Meranda from Fairytales and Fitness. When you're done here, be sure to check these ladies out! 1. When I was kid I wanted to be a pilot. I think I was in 6th grade when I fully realized this dream. We had a career day and an airline pilot was there and talked about the fun and rewarding job he had as a pilot. He mentioned that there were very few female pilots out there and it was an up-and-coming career path for women. Well, say no more. I went full throttle into researching becoming a pilot, what college I would go to (Embry-Riddle Aeronautical, of course), which airline I wanted to fly and so on. But then one spring break, I think it was sophomore year in high school, we went to the Bahamas for vacation. The flight was AWFUL and I got very sick. It kind of made me re-think the whole pilot thing and I really lost the vim and vigor I once had. It's a little embarrassing that my career hopes were dashed by some air sickness but that's just how it goes sometimes. 4. I have an awful phobia of insects and rodents. I do not love insects at all and have a hard time being in the same vicinity as an insect. When I lived on the east coast, crickets would often come in the house when the temperatures dropped and some of my worst nightmares include seeing a cricket in my room. I've had nightmares of being attacked by mice as well. I have a vivid imagination, apparently. 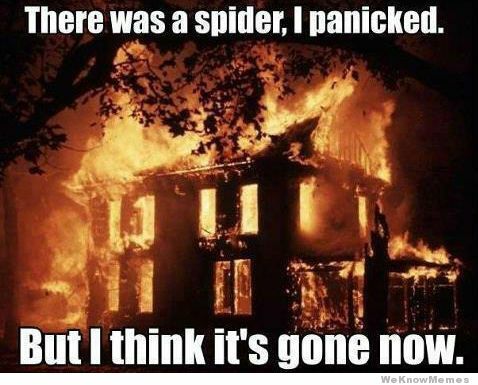 But the worst has to be spiders. They are just too awful for me to even talk about in full detail. Now that I'm a mom, I have to keep my fears in check so I don't pass them onto my kids. I will usually run away when I see something and go scream in the bathroom or cry in my closet. 5. The summer before my senior year in high school, I was lucky enough to be an exchange student for the summer. I went to Australia for 4 weeks and it was amazing. But I was 16 and didn't exactly appreciate it as much as I should have. We went to Canberra, Sydney, Brisbane, part of the Outback and even the Great Barrier Reef. We also stayed with two different families and went to school with the kids. I often forget that I even went there, which is why I wanted to bring it up now. It was a great experience and maybe if I think about it enough, we can make a plan to go back. I recently got back in touch with a couple of the friends I made there through Facebook, which was pretty awesome. It was fun but I would love to go back as an adult. Someday, we will! Perhaps I can plan it around some ultra...now that would be amazing! Now it's your turn! Share something only a few people would know about! I hate flying, so no way could I ever be a pilot. I wanted to be a vet until middle school science. Dissecting the cow's heart put the nail in that dream. I have always wanted to work with animals but it just would be too heartbreaking for me. That is very cool you got to spend some time in Australia. I would definitely like to visit there someday. What a trip that would be! Yeah it was a great trip. I just wish my 16-year old self realized that at that time and could appreciate it more! 1. Like you, I always wanted to be a pilot, but I actually followed through with it and earned my private pilot license when I was 23. I don't fly too often anymore, but it's a blast. Although, I once almost crashed during a tricky landing in VA Beach because of wind shear. But any landing you can walk away from is successful, I suppose. 3. I'm afraid of the ocean because I've felt close to drowning too many times to enjoy it anymore. So, I stay close to shore and generally don't wander out to a level above my shoulders. I can swim, but not well; I should just take a couple refresher lessons, y'know? 4. I'm a twin. That's not too unusual, but my brother and I have experienced incidents where we were thinking or feeling eerily similar to each other. And we've had remarkably similar health things happen. I don't know what it's like to be a "single" sibling, because I've always been paired up with him! Good list, Sparky! I knew all this except your fear of the ocean. I don't love being in the ocean either. I get really nervous because I'm not a great swimmer either. We can take refresher lessons together! 1. I took flying lessons too! Flew over the old three rivers stadium. So cool. I like your thinking regarding the number of legs. I feel the same way. There's always time! At least I hope there is! For some reason gerbils and hamsters don't bother me. It's mice and rats that make me want to puke and run away screaming. I had wanted to be a singer for as long as I can remember… Four or five years old at least. My parents gently suggested that (1) I didn't have the temperament to be in "show businesses" and (2) it would be best to pursue a career that offered health benefits. Fast-forward 40 years, and now just before I turn 50, I've enrolled in private voice lessons. Good for you, Lisa!! Do what makes you happy!! Thats so awesome! Absolutely!! I love a good banana and PB sandwich, though I haven't had one recently since I've been trying to limit gluten. But I would make them like grilled cheese too. So ooey and gooey good! And now I've seen the kitchen where those delights were made in Graceland! Australia is definitely a place I'd love to visit! 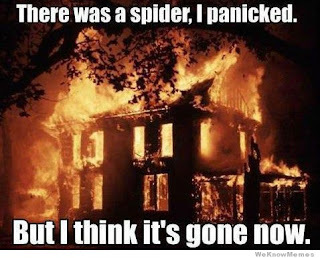 I'm not overly fond of insects but I can deal with most of them. Except bees. I think mice are cute (except in your own house). There's something about mice that makes my skin crawl. The worst nightmare I've had has been where I get attacked by a swarm of mice. I blame this foreign film we watched as part of a film class I took in college which had a scene like that. Ugh!! So horrifying. How cool you got to go to Australia. I feel the same way about England and Ireland when I visited there when I was 16 on a school trip. I'd love to travel back now that I am older to appreciate it a bit more. I would love to go to England and Ireland someday!! Exchange to Australia SO FUN! I did my exchange to France. Hardest but best thing. Australia is still on my to travel list. France would be amazing too!